Event Dimensions is proud to introduce our new collection of LED games! 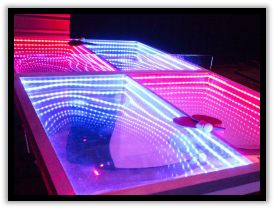 Our LED Games will be sure to light up any event you throw! Your guests will absolutely be impressed with all the lights and action you are bringing to the party. Old favourites like Pool, Table Tennis and Darts combined with some new games and the fun doesn’t stop. What is even better? You can customize our LED Games with your logo, customer graphics or the lights to match your corporate colours or your favorite sports team to make sure your event stands out!